The Walk Away Dress–Sacrilegious Fit Solution? With winter in the Midwest finally behind us, I’d like to make some dresses from my fabric stockpile. Of course to get me back into the swing of things, I thought I’d do the Butterick 4790. I know full well that the re-released pattern comes with a slew of fit issues. So I pose the question: has anyone used a zipper? I know that it’s not conventional, but neither am I. 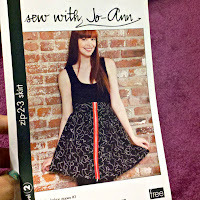 The re-release pattern uses a full circle skirt instead of a half circle as the original did. Wouldn’t a zipper up the front balance out the weight of the back of the dress and keep it closed for less of a flyaway mishap? Here is an example of the full zipper. The zipper would also eliminate the need for a button closure. I’m picturing something like a coat zipper that comes all the way unzipped. Image courtesy of SoulStiches Blog as mine would not load. The zip idea sounds great, I think it would work. Why not? Schiaparelli used zippers on the front of some of her dresses in the 30s. Right. My fix is to create a waist seam in the bottom layer and give it a half circle skirt. That A) gives it a better anchor at the waist, B) eliminates the awkward straight front skirt with no back to hold it down and C) balances the front and back. Been considering this pattern and read a lot of reviews on it. The main problem seems to be the top part. The chest and shoulder area are unbalanced and large. The pieces that wrap around in the front are curved (not straight as in the drawing and the original), and it all comes together and creates an unflattering quarterback shoulder-effect. I made the walk away dress last year and for me the skirt was fine. The fit issue was mainly down to the armholes, lots of flappy material resulting in flashing my bra everytime I moved my arms! My quick solution involved a lot of strategic safety pins! I have only worn it once which is a pity because I loved the full skirt. I’m planning on wearing it again soon but this time with a cardigan to preserve my modesty! I think a zip would fix the fly-away skirt issue for sure, but the weight balance issue is between the straight front underskirt part and the circle skirt. Putting a zip on the circle skirt won’t fix that issue, the front of the dress will still ride up hiking the neck higher, and pulling the shoulder seams down the backs of your shoulders. To fix the weight issue, you either have to attach the the bodice front and back together more securely (I’m thinking of some button loops/buttons inside where a side seam would be) or making the under skirt and over skirt weigh the same. Or maybe do both. I’ve made this dress twice (once for a friend and just recently, for myself). In both, I made the front of the dress in a contrast fabric, so zippering up the front of the dress defeated the look I was going for. I liked the “fly away” of the full skirt so you could see a peek of the patterned fabric underneath.